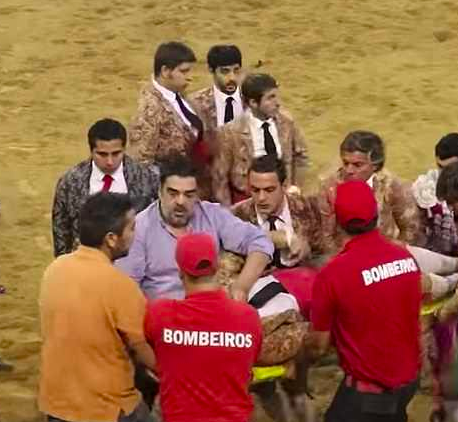 Shocking footage shows the moment six bullfighters were charged by a bull at an event in central Portugal, leading to one of the bullfighters to experience a seizure. The man in question, who has been named as Fábio Francisco was rushed to hospital and was found to have suffered a head injury. He has since recovered. The video shows how chaos erupted in the arena, with the angered bull charging through the bullfighters with horrifying ease; knocking them flying. Francisco can be seen being helped from the floor on to a stretcher while the other men look on with grave concern. Some of the men have blood spatters on their traditional uniforms. Bullfighting is of course controversial and many of those who have watched the video have left some heated comments to show their dislike for this cruel sport. I fully support their cultural heritage to do this sort of thing, but I also fully support the bulls when they manage to stove someones forehead in. Nasty little parasites goading and tormenting a gentle and noble animal. Good work internet virtue signallers, enjoy your bacon tomorrow morning. Portuguese bullfighting differs in some ways from Spanish bullfighting. In the Portuguese tradition, the main bullfighter – known as the Cavaleiros – fights the animal on horseback; shoving sharp, colourful sticks into the bull in a bid to wear it out from bleeding. The Cavaleiros is assisted by the Forcados; a group of unarmed men who taunt the bull into charging forward. 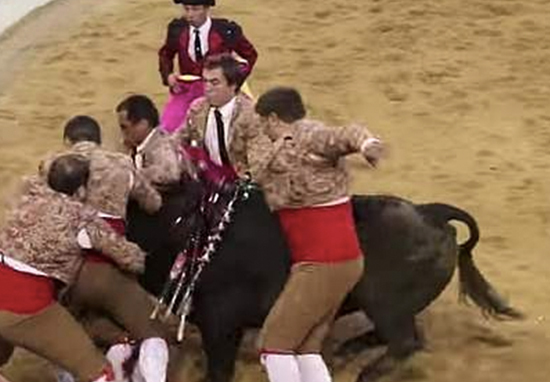 The bullfighters will then aim to surround and subdue the bull. Following a Portuguese bull fight, the bull is usually slaughtered by a butcher or else nursed back to health to be used for breeding purposes. This differs from the Spanish tradition where the bull is usually killed while in the arena as part of the entertainment for the cheering crowd. In July 2018, Portuguese lawmakers rejected a proposed bill to outlaw to outlaw bullfighting by an overwhelming majority. The bill, which had been put forward by animal rights lawmaker, Andre Silva, won a mere 31 votes in the 230-seat Republican Assembly. 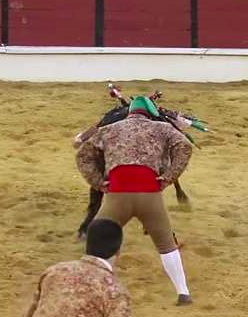 During the debate, Silva, who represents the People Animals Nature party (PAN) described bullfighting as ‘consisting in showing the most abject cowardice that the human species is capable of’, as reported by the Portuguese American Journal. We are ready to reject [the idea that] mutilating and tearing the flesh of an animal, making him spit blood, is a cultural tradition. Portugal continues to be a country that largely ignores the interests of animals, which summons us all to the rejection of bullfighting spectacles and, consequently, justifies the present bill. Many of those who are in support of bullfighting view it as part of their Portuguese heritage and feel they have a constitutional right to this form of ‘cultural entertainment’.